John OIiver gets stuck into Fraser Anning. He's known for his scathing humour and love of getting stuck into Aussie politicians. 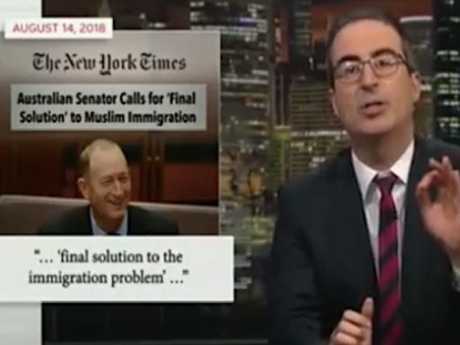 And British late-night host John Oliver didn't hold back when it came to Senator Fraser Anning in the wake of the Christchurch mosques attack. The British comic took aim at Senator Anning's controversial comments about immigration, calling the One Nation politician " a huge f----ing ---hole". John OIiver did not hold back when it came to Fraser Anning. 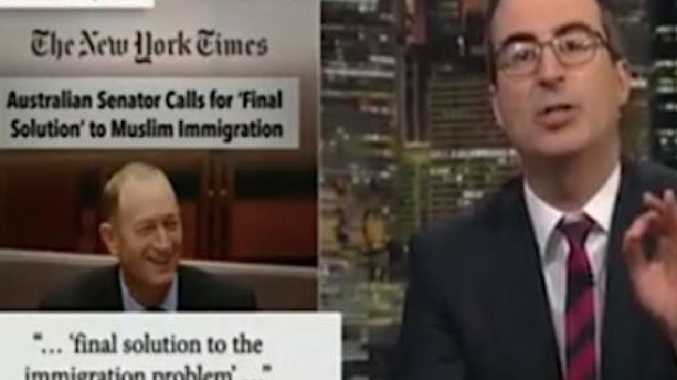 Oliver dedicated his opening segment of Last Week Tonight to the New Zealand terror attack that killed 50 Mulism worshippers and shocked the world. "Look, this wasn't just a disgusting act from a f---ing ---hole, it was a total affront to the basic values of the people of New Zealand," Oliver said. Oliver described Senator Fraser Anning as a hardline politician and “melted candle of (famed actor) Ed Harris”. The comedian then threw to a clip of New Zealand's Prime Minister Jacinda Ardern, who said, "We were not chosen for this act of violence because we condone racism, because we're an enclave for extremism. We were chosen for the very fact that we are none of these things." Oliver said: "She's absolutely right, because New Zealand is an incredible place. And I know that we make fun of it on this show all the time. There is honestly nothing I like more than making fun of New Zealand. The late-night host praised the actions of “Egg Boy” William Connolly. "But part of that may be because controversies over there tend to get handled with charm and good cheer. "My point is, New Zealand is amazing, and it is showing its strength in how it's been responding to this tragedy. The same, sadly, cannot be said for Australia's Fraser Anning - a hard-line racist politician and melted candle of Ed Harris." Oliver then referred to Senator Anning's statement that read, in part: "The real cause of bloodshed on New Zealand streets today is the immigration program which allowed Muslim fanatics to migrate to New Zealand in the first place… Muslims may have been the victims today, usually they are the perpetrators." "Holy s---. 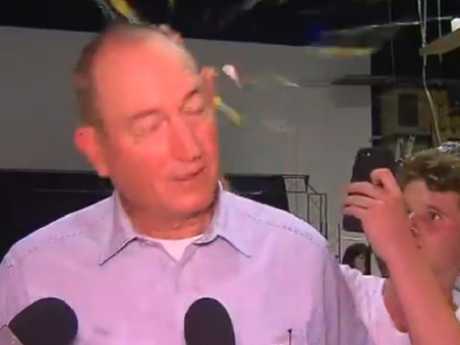 That might be the worst possible response to what happened," Oliver replied, before airing a clip of "Egg boy"-the 17-year-old who smashed an egg over the racist politician's head in Melbourne. 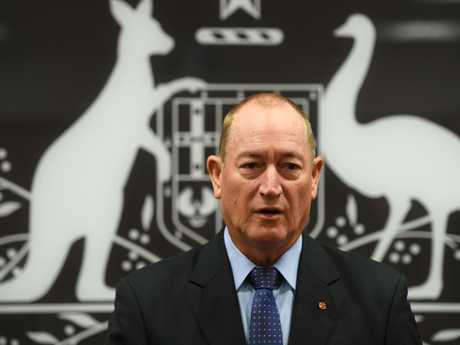 "The real cause of Fraser Anning getting hit with an egg is Fraser Anning saying things that prompt people to throw eggs at him," Oliver read from a statement, aping Anning's. "He may be the victim today, but usually he's a huge f---ing ---hole." Oliver saw the funny side of Fraser Anning being egged. Renowned satirist Oliver has a penchant for taking the mickey out of Aussie politicians. In February 2018, he made fun of the Barnaby Joyce scandal by pointing out that Mr Joyce had opposed gay marriage in Australia due to his belief in traditional family values. 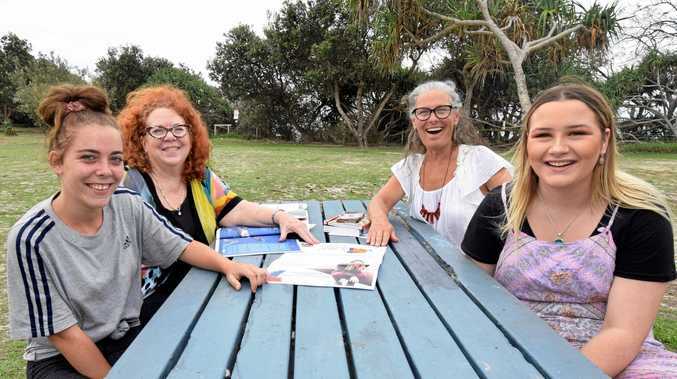 "You might think that that is hypocritical, but in reality Joyce has such incredible family values that he can't restrict them to just one family," he joked. "The Australian media has understandably jumped on this story like a deputy prime minister with a wife and four children jumping on his 33-year-old former media adviser." He also took aim at Mr Joyce over the "Pistol and Boo" saga. The then Nationals leader threatened to euthanise Johnny Depp and Amber Heard's pet dogs Pistol and Boo when the stars snuck them into Australia in breach of strict quarantine laws, Oliver said: "I've got to say that's pretty ballsy. Elected officials very rarely risk openly telling puppies to go f--- themselves."